In 1978 IBM introduced the System/38 as part of its midrange platform hardware base. One of the many outstanding features of this system was the built-in Relational Database Management System (RDMS) support. The system included a utility for defining databases, screens, and reports. This utility used a form named Data Description Specifications (DDS) to define the database physical (PF) and logical (LF) files (base tables, views, and indexes). In 1988, IBM announced the AS/400. The OS/400 operating system also contained a built-in RDMS, however, IBM offered Structured Query Language (SQL) as an alternative to DDS for creating databases. In addition, SQL Data Manipulation Language (DML) statements were made available as an ad hoc query language tool. These statements could also be embedded and compiled within high level language (HLL) programs. SQL Data Definition Language (DDL) has become the industry standard for defining RDMS databases. Many customers are in the process of modernizing their database definition and the database access. 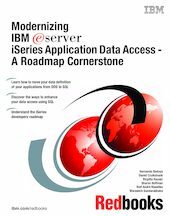 This IBM Redbooks publication will help you understand how to reverse engineer a DDS-created database along, and provides you with tips and techniques for modernizing applications to use SQL as the database access method.